ACOTNEWS has recently been edited to resolve some technical issues related to sizing of the pages. At this time any image 'size' problems you have should be easily and quickly resolved by using the 'zoom' feature of whatever browser you are using. In editing the pages we also addressed some 'readability' issues. Our members and other visitors enjoy our 'Members and Cars' section. That page has also been edited. We encourage all members to submit images of their cars that have not be included. In other cases, a photo used might not be the owner's favorite. We encourage you to provide your preferred image. The image can be either a regular hard copy photo or an image transmitted through email. ACOT Spotlight, a bit of history on one of 'ACOT's cars'. This was the first car that I purchased after joining ACOT in 2006. 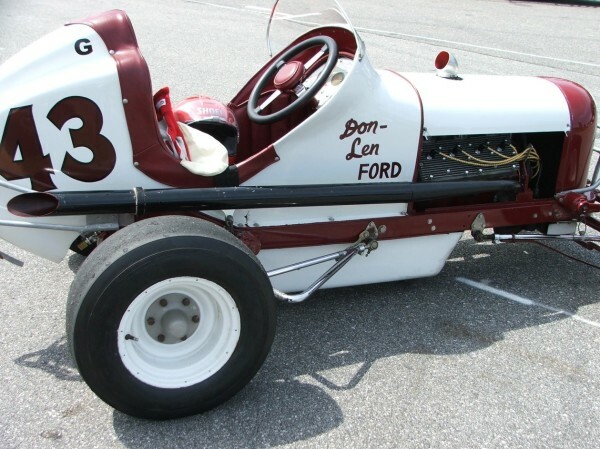 It raced in the Northeast in the 1930's and 1940's and was driven by many different drivers, some of whom are listed in the historical information below. 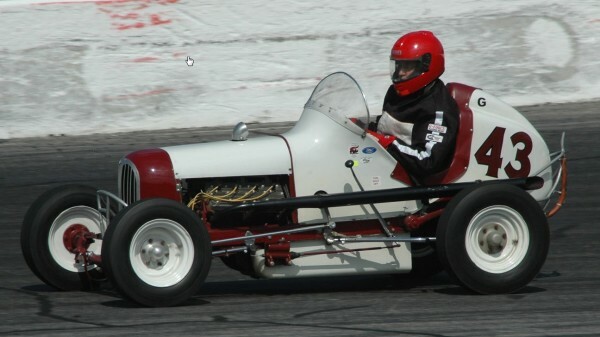 I have run the car at many ACOT events, and also at Thompson Vintage and New Hampshire Motor Speedway Vintage events. It has a rail frame with a Hillegass aluminum body. The engine is a Ford V8-60 with a single Stromberg carb, aluminum heads and manifold, and total loss ignition. It has an in-out box transmission, so it must be push started. It has been a very reliable car, although it tends to overheat a bit, which is typical for the V8-60 engine. 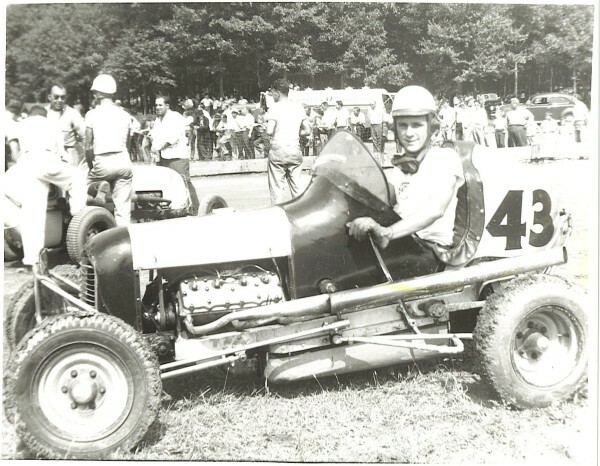 This picture was taken in 1947 at Hilltop Speedway, Myerstown PA. The driver is Eddy Roberts, who was 18 years old at the time. 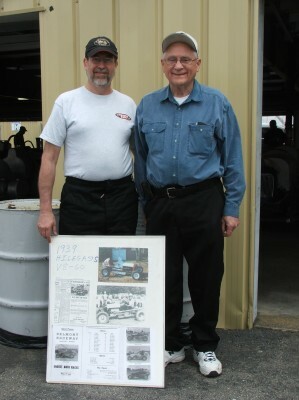 Alan Preliasco and Eddy Roberts at the 2008 NHMS Vintage Celebration. 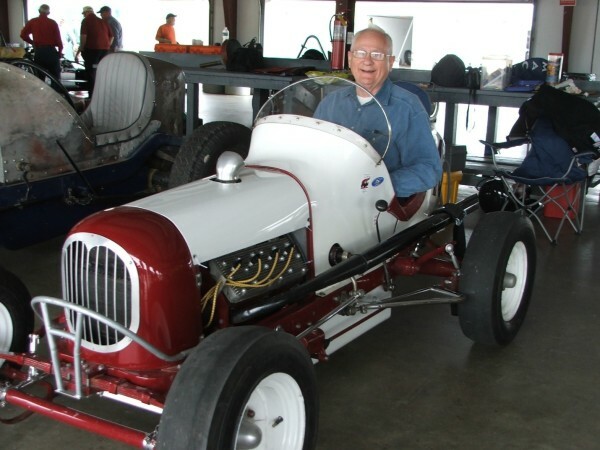 I had the midget in the pit garage at the NHMS Vintage Celebration in 2008. Just by coincidence, Eddy Roberts and his wife were in attendance. This is Eddy in the car 60 years after the original picture was taken! We found a racing suit that fit him, and he drove exhibition laps around the Speedway. His wife said that she made him quit racing because she felt it was too dangerous. How true! Scroll down to see images of ACOT 'points' events as the 2017 season progressed. The final event of the year was our banquet held at the I84 Diner in Fishkill, New York. This year's event was notable as it marked the retirement of our president, Bill St. George. Bill can be proud of his service to the club with his 21 years in that office. He has successfully presided over an evolving and challenging vintage racing environment . He has been a tireless promoter of the club and the sport. Among the many assets he brought to the position was an always calm and even approach to issues at hand. Sometimes not an easy task when the membership appeals to and includes many ex-racers and would be racers. His knowledge, experience, and network of friends in the racing community will continue to be a huge asset for ACOT. Over 40 members and guests enjoyed an afternoon of presentations, conversation, several slide shows and videos. Of course, there was plenty of bench racing. The I84 diner is centrally located for the convenience of our 'geographically challanged' membership (NY, NJ, PA, MA, CT, and more). The food and service is first rate, the function room is modern and well equipped for our meetings and social gatherings. Presentation clock is given to Bill St. George (on right) at 2017 ACOT banquet. Bill has retired as club president after 21 years of leadership in that position. Club vice president Bill Goodfellow (center) and incoming club president Keith Majka are making the presentation. One of the club's favorite events is the Kutztown fair where they serve wonderful breakfasts and also an Amish specialty 'shoo-fly pie'. Bill just loves shoo-fly pie. Mary Jo Waples made one for Bill in rememberance of Kutztown. For those of us who can push away from the table, there is also track time at the fair. Each year ACOT recognizes levels of participation at our events through out the season. Here, Rusty Pinney receives his award along with a few choice comments from some of his friends in the room. Afton Motorsports Park, July 14 and 15. We had a very good turnout in spite of the poor weather. Friday evening was a rain out but ACOT members enjoyed a fine Italian meal at a local resturant. A fun evening of bench racing. Saturday was cloudy but rain free. There was an abundance of track time for everyone which was enjoyed by our club and members of a vintage stock car club that also participated in the day. ACOT had a great turn out for the Pocono event Aug 18 to 20. Our display cars were front and center in the prime paddock viewing area. Not evident in these photos because of the times they were taken, thousands of people enjoyed our display. We had many great conversations with interested fans who stopped to chat or have their picture taken with our cars.